We’d love your help. 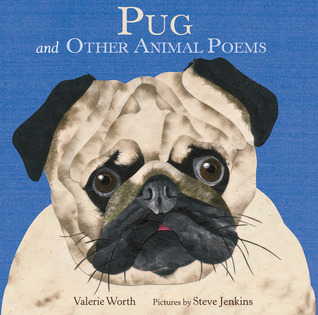 Let us know what’s wrong with this preview of Pug and Other Animal Poems by Valerie Worth. In the follow-up to the well-received Animal Poems, Pug: And Other Animal Poems examines a wide range of animal behavior, from the fleetingness of a fly sipping spilled milk to the constant steely presence of a powerful bull; the greedy meal of a street rat to a cat's quiet gift of a dead mouse on the doorstep. Steve Jenkins's bright collage art brings these small moments In the follow-up to the well-received Animal Poems, Pug: And Other Animal Poems examines a wide range of animal behavior, from the fleetingness of a fly sipping spilled milk to the constant steely presence of a powerful bull; the greedy meal of a street rat to a cat's quiet gift of a dead mouse on the doorstep. Steve Jenkins's bright collage art brings these small moments to life. To ask other readers questions about Pug and Other Animal Poems, please sign up. As I've written on previous occasions, I have an index card file box filled with canary-colored index cards upon each of which I've copied a favorite children's poem and the bibliographic information for that poem. The initial set of cards in my poetry box -- organized by category -- animal, child, community, machines, plants, physical forces -- was compiled nearly a quarter-century ago, while I was studying early childhood education and I was spending forever in the library reading scores and scores of children's poetry books and anthologies to find the ones that really turned me on. This box was then employed every day at circle time when I'd always take a minute to pull out a card and read aloud one of those poems. So, in reading PUG AND OTHER ANIMAL POEMS, a posthumous collection of Valerie Worth's works, I recall reading most of these poems way back when, including some that made it into my poetry box. So, what is mind-blowing to me about this posthumous collection, is the skill exhibited by collage artist Steve Jenkins to bring each of these poems to life. Jenkins, a guy who already has received Caldecott recognition in the past, continues to grow his already amazing artistry. Look at the cover illustration for the title track, PUG. Look at the folds of skin on the forehead. Look the lighting on the nose. Look at the eyes and the eyebrows and the whiskers and the jowls. How the heck does he bring paper to life like he does? I just wish that I could go back to being the poetry-obsessed nine year-old that once was so that I could see these spreads through those eyes as I read these poems aloud to myself. Get set for rats and fireflies, bulls and opossums, fish and sparrows and pigeons. A total joy to stare at and read aloud, this is a collection you cannot miss. Move over Jack Prelutsky! In her lifetime, Valerie Worth wrote just about the finest poems for young readers in contemporary American Lit. And they didn't have to be rhyme-y, whimsical things. Worth's collected works, All the Small Poems and Fourteen More, is a classic. An inspired teacher could use Worth's poems to teach kids a genuine appreciation of poetry, even to reluctant readers and those with LDs. Hers are precise, simple poems that find in ordinary things Blake's universe in a grain of Move over Jack Prelutsky! In her lifetime, Valerie Worth wrote just about the finest poems for young readers in contemporary American Lit. And they didn't have to be rhyme-y, whimsical things. Worth's collected works, All the Small Poems and Fourteen More, is a classic. An inspired teacher could use Worth's poems to teach kids a genuine appreciation of poetry, even to reluctant readers and those with LDs. Hers are precise, simple poems that find in ordinary things Blake's universe in a grain of sand. Pug is a magnificent book. Each poem celebrates a different animal, both wild and domesticated. Steve Jenkins' (What Do You Do with a Tail Like This?) collage art is a spectacular counterpart. I truly love this book. Short poems on appx. twenty animals are illustrated by paper collages. The animals range from the prosaic to the exotic and the tone and perspective of the poems vary but always contain close observation and a spirit of inquiry. I'm not usually a huge fan of poetry, but I loved this book! Granted, the poetry was definitely outshadowed by the amazing illustrations, but they were still enjoyable. Jenkins can pretty much illustrate anything and I will read it. Brief Book Summary: This book has a collection of 18 free verse poems with illustrations to accompany them. Every poem is about a different animal that the author analyzes and then brings certain aspects of that animal into perspective. The connection between nature and animals is brought to light through the use of poetry. This collection features 18 free-verse poems about the animal kingdom, including insects, fish, birds, wild animals and three pets: a dachshund, a prowling cat and the titular pug, shown in an appealing head-on view on the cover. Some of the animal subjects are less than engaging (a dead mouse left on the doorstep, a rat surrounded by garbage), but Worth finds tiny details and meaningful observations in each animal she examines, asking readers to accept any animal as a worthy subject for poetic examination. A few of the poems will be accessible to younger children, but most are more appropriate for children in upper-elementary grades or middle school; some will demand an adult’s help in interpretation. Jenkins provides illustrations in his dazzling paper-collage format with impressive results, from a luminous firefly to a snarling tiger. There is no thematic flow or organization of the poems, so readers hop about the animal world in a slightly jarring manner, though the illustrations are captivating whatever the subject. I like how both reviews pointed out the bold, colorful illustrations that helped to highlight the subject of each poem. I agree with the second review that states some of the concepts may be too sophisticated for younger readers. I would say that this book is age appropriate for any child in elementary school, though. The first review states that this book may be good for middle school students, as well, which I would also agree with. The lack of organization and flow from one poem to the next makes this book better for younger children. However, the figurative language makes this a good selection for older elementary students/middle school students too. The illustrations add to the depth of the free verse poems. The fact that all of the poems are free verse also shows children that not all poetry needs to be structured. I would definitely use this book as a mentor text when teaching a mini lesson on poetry. I could have students create their own free verse poems about animals and nature. I also think it would be beneficial to allow students to look at this book on their own time by leaving it out during silent reading time. This book is an interesting compilation of multiple poems about pugs and various animals. I would give this book 3 out of five stars because of its interesting nature and multiple poems about children's favorite animals. I enjoyed the illustrations very much!!! Great collection of poems.My favorite poem is Opposum.Amazing collages by Steve Jenkins.A great book for 3rd grade and up. Poetry rhymes about various animals are accompanied by colorful collage-like illustrations. Opening line/sentence: Nearly a myth, his shady mask, his flickering feet, his fiery tail; streaking the dark like a fabulous comet - famous, but seldom seen. Brief Book Summary: This is a book full of poems. With every page turn, there is a new poem about an animal - such as a fox, cat bunny, and a bull. Short poems about fish, birds, insects, amphibians, and mammals will delight young children. A cicada coming out of its shell is described: A fairy/ Tale come/ True: the/ Humped brown/ Gnome split/ Up the back,/ The silver-/ Caped prince/ Set free. In Mouse a dead mouse is memorialized, Left as a gift on the step. A cat, pug, and dachshund represent household pets. An opossum, fox, and toad are some of the familiar wild animals. A fly sipping a drop of milk, geese in flight, and a caged Bengal tiger look almost real in spite of being collages. Bright pictures of animals are against plain colored backgrounds. On a black page a firefly flashes its light. Children will enjoy these short, imaginative animal poems and pictures. A follow-up to Animal Poems, the first collaboration by Worth and Jenkins (2007). Eighteen animal poems make up this collection. 2013, Farrar Straus Giroux Books for Young Readers/Macmillan,, $16.99. Ages 4 to 7. Following up on Animal Poems, Jenkins again selects an array of elegant free verse by classic twentieth-century poet Valerie Worth, combining each of the eighteen verses with a dramatic cut-paper portrait of its animal subject. Worth s poems are precise and gemlike in their glittering compactness; some are gently playful (pugs are what/ Some people/ Might call plug-ugly/ Perhaps because, for/ Dogs, they look/ A lot like people ), others reach heights of grandeur ( The bull/ Would not/ Melt: but/ Had to be/ Hacked out,/ Rough-hewn,/ From the planet s/ Hard side ), and all display her delight in consonance, assonance, and careful wordsmithing. Jenkins ramps up the impact with compositions of tight focus, posing animals mostly against contrasting backdrops of solid rich color (the bull s dark bulk looms across a three-quarter spread of flame red; a firefly, lacework wings in stop-motion stillness mid-flight, floats in a sea of nocturnal dark blue). His birds especially transcend the static genre, with geese bodies contracting and flexing as they soar and pigeons wing-beats fluttering across a city skyline. The sonorousness of the poems make them terrific readalouds, their compactness and engaging subject will appeal to reluctant readers, and their craftsmanship will draw established poetry fans. Review Code: R* -- Recommended. A book of special distinction. (c) Copyright 2006, The Board of Trustees of the University of Illinois. 2013, Ferguson/Farrar, 32p. ; Reviewed from galleys, $16.99. Grades 3-7. Response to Two Professional Reviews: Both reviews give a thoughtful recommendation for for Worth's poems. Each review gave an example of poems as well. I agree with the second review in saying that the poems would be terrific for read alouds because the subject matter would interest all readers. The poems are short and imaginative that make they easy to read. Evaluation of Literary Elements: This book would immediately engage readers with the illustrated animals and bright colors. The poems would appeal to all students through Worth's easy style of writing. Consideration of Instructional Application: This book would be used when teaching a poetry unit for first or second grade. The poems use an abundance of describing words that enable students to visualize what they are reading. After reading aloud some of the poems, I would have students write their own animal poem. Before writing their own poem, I would have them help me think of descriptive words to write on the board that would help them in their own writing. This was a humorous collection of poems about many different animals. Although it featured several dogs, it also ranged from tigers to birds and discussed animals of all shapes and sizes. It took a comical, realistic look at these creatures from a human perspective. For example, the author points out how the fleeting fox is seldom seen, rabbits keep their distance appearing in deep thought, and even how pugs resemble ugly humans. I appreciated the way that it made these observations that we can all relate to. I would recommend these silly poems as a read aloud to any grade level because all children enjoy talking about animals. This would be a good book to use to create a better appreciation of poetry in your students. Furthermore, it would be beneficial for older grades because there is some higher level vocabulary and inferences that the younger students may miss when reading it. Worth, V., & Jenkins, S. (2013). Pug: and other animal poems. New York: Farrar Straus Giroux. I love pugs, so the cover of this book captured me instantly. In fact, the illustrations are delightful. Steve Jenkins employs collage in a way that makes the animal images appear three-dimensional and textural. Valerie Worth's poems, a different animal for each two-page spread, range from the "Awww! Cute!" dachshund who finds it "hard to keep from drooping/When you've got so long a body--" to the "Huh, that's...kind of weird" dead mouse who was brought in as a gift by a cat. If you are one to prefer the cute type of poem, the excellent Once I Ate a Pie might be more to your taste. Pug: And Other Animal Poems is a darling book of short poems, each about a different animal. It ranges from household pets, to insects, to animals most of us will only ever see in a zoo! Each poem describes the animal and uses beautiful language to describe the life it leads. The pictures area also very well done and have a construction-paper texture look to them, so they really pop off the page! I think children would love this book, because it has short poems they can focus on, the pictures ar Pug: And Other Animal Poems is a darling book of short poems, each about a different animal. It ranges from household pets, to insects, to animals most of us will only ever see in a zoo! Each poem describes the animal and uses beautiful language to describe the life it leads. The pictures area also very well done and have a construction-paper texture look to them, so they really pop off the page! Steve Jenkins's, the author of this book, uses collage art with bright colors to bring moments of animal behavior to life. As the review of the book states, “[there is] a wide range of animal behavior, from the fleetingness of a fly sipping spilled milk to the constant steely presence of a powerful bull; the greedy meal of a street rat to a cat's quiet gift of a dead mouse on the doorstep.” I honestly couldn't say it any better myself. This book really shows the beauty in the small things. I rea Steve Jenkins's, the author of this book, uses collage art with bright colors to bring moments of animal behavior to life. As the review of the book states, “[there is] a wide range of animal behavior, from the fleetingness of a fly sipping spilled milk to the constant steely presence of a powerful bull; the greedy meal of a street rat to a cat's quiet gift of a dead mouse on the doorstep.” I honestly couldn't say it any better myself. This book really shows the beauty in the small things. I really enjoyed looking at all the vibrant illustrations and poems. This poetry book looks at animals in a slightly different way. Valerie Worth depicts animals by the experiences she has with them in addition to the way she sees them. Despite the fact that there's a pug on the cover, I have to admit, I liked Animal Poems better than Pug and Other Animal Poems, but not by much. Not only is the poetry in this book dripping with gorgeous language, but Steve Jenkins's paper cut-out illustrations feel so three-dimensional that they almost jump off the page. Other than the pug, the bengal tiger is my favorite illustration in the book. It is so complex and full of texture. Simple, yet highly descriptive poems about animals, combine with simple, yet detailed collage art to form the perfect poetry book for young readers. Recommended for kindergarten through 3rd grade. Children could use these poems as a jumping off point for an animal research project. After I read "Wood Thrush," I immediately went on the internet to hear its call, which was so beautifully described in the poem. Five out of five stars. Poems about animals both wild and domestic. There's a little bit of everything in this collection of poetry: warmth, humor, even a touch of sadness. Favorites include "Fly" about a common house fly and "Bengal Tiger" about a regal beast caged in a zoo. Cut paper collage illustrations are incredibly detailed and bring beauty to each animal while the variety of materials used adds delicious texture and depth. Well-known, prolific and talented paper artist Steve Jenkins brings to life a follow-up collection to Animal Poems by the late Valerie Worth. Jenkins' work is expressive and accurate, bringing depth and texture to his cut-paper illustrations. A great choice to share with children of all ages. This is a poetry book with different short poems about animals. Some of the poems are very cute, one about a mouse, I don't feel would be the best to talk about in a class setting. These poems do not rhyme but they all show different types of poems. This would be a good book to show kids that not all poems have to rhyme. My favorite poems in this book were Fox and Bull. The s and f sounds used give a good sound quality to Fox. He is compared to a mythical character, and words like fiery, streaking, and famous present him in an epic manner. I enjoyed the metaphor that compares the rough hewn bull to hard rock cut from the Earth. This short book of poetry describes the antics of different animals, accompanied by collage art illustrations. I just love Steve Jenkins's paper collage illustrations. My favorite in this poetry collection about animals is the tiger. Valerie Worth's observations of the beauty of the animal kingdom are at times amusing, brutal, simple, and beautiful. Kids will enjoy this one a lot! These are some of the best animal poems! The poems capture the intrinsic elements of each animal some with humor, some with beauty. Jenkins' illustrations are absolutely captivating. Savor each detail of the paper cut illustrations before and after reading the poem. Some of the poems worked better for me than others, loved the illustrations on a plain bright background. Jenkins always does a great job - the opossum and the fly are realistic enough to gross me out! Acclaimed poet Valerie Worth Bahlke was born in Philadelphia, Pennsylvania, and grew up in nearby Swarthmore, where her father taught biology at Swarthmore College. The family then moved to Tampa, Florida, and Bangalore, India, where they lived for one year. Valerie returned to Swarthmore to attend college, graduating with an English degree and High Honors. Shortly thereafter she married George Bahlke, a fellow Swarthmore graduate. After settling in Clinton, NY, Valerie met Natalie Babbitt at Kirkland College, and Natalie began to illustrate Valerie's work, starting with Small Poems in 1972. Three more volumes followed: More Small Poems (1976); Still More Small Poems (1978); and Small Poems Again (1986). All four volumes were issued in a single paperback, All the Small Poems (1987), and seven years later, All the Small Poems and Fourteen More was released and was then followed by a paperback edition in 1996. In 2002, FSG posthumously published Peacock and Other Poems by Valerie Worth, with pictures by Natalie Babbitt, a collection of 27 poems which Publishers Weekly, in a starred review, said "heralds the joy of words." School Library Journal, in a starred review, declared that "[Valerie Worth's] work gives children something to admire and aim for." Valerie Worth was honored by the National Council of Teachers of English (NCTE) in 1991 with its Poetry Award for Excellence in Poetry for Children, which acknowledges a body of work.